A deck without a bar is just a deck. Add a bar and it’s a party deck. Over the weekend I built a simple pallet bar for my pallet deck. If you missed last weeks Two Level Pallet Deck Post follow the link to check it out. The deck is unique and 100% pallets. The bar was built using 2 pallets and numerous boards from pallets. I stood the pallets on their sides and connected the two pallets using 2ft boards inside and on top. I then added the boards to the sides and covered the outside of the pallets with more boards. To finish the bar off I added boards across the bottom and top. I wanted a concrete countertop for my bar without having the mess of pouring my own concrete. I’ve never poured my own concrete and not sure I really wanted the mess. 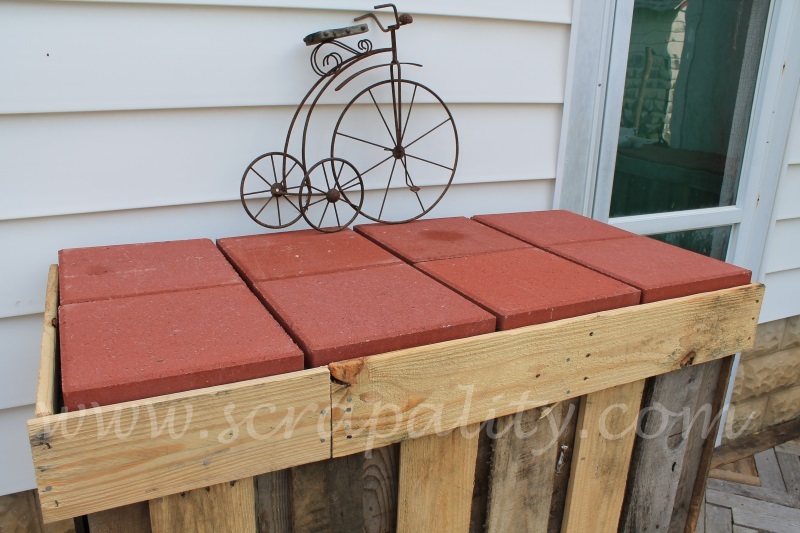 12 x 12 stepping stones are cheap and they make a wonderful alternative concrete countertop. Place the stones side by side and there you have it, concrete countertop. It really doesn’t get any easier then stepping stones. My husband voted for the red stones instead of the traditional grey. I think he made a wonderful choice. The red adds color to the brown and white color scheme on the deck. My backyard is finally starting to look like a backyard instead of a shipping yard. More projects to come… Stay tuned! If you’re a party host and would love for me to share my work with you, drop me a comment! 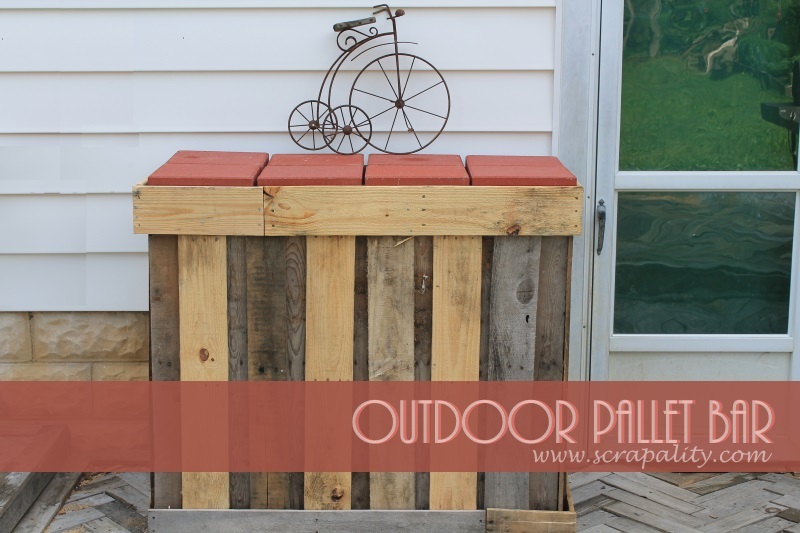 This pallet bar is awesome! It reminds me of a cafe I visited once in Canada called “The Bicycle Thief.” It was a super cute cafe with lots of eclectic, bike-themed decor and this photo just made me think of it! But anyway, the pallet bar is perfectly done. Nice job! Love it–looks awesome! Thanks for linking up at the Bewitchin Projects party this week! I can’t wait to see what you link up again on Sunday over at OurMiniFamily.com! Ahh, very nice! I like the idea of stepping stones for the top. I never thought of that when we were looking for a top for ours. Thanks for inviting me to your link-up. I posted my pallet deck island today. 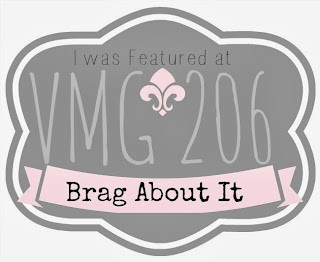 I’m glad to meet you and your blog!